Mac 'N Cheese to the Rescue: 101 Easy Ways to Spice Up Everyone's Favorite Boxed Comfort Food by Kristen Kuchar is a cookbook made for busy families like mine. Kuchar writes simple and straight-forward recipes. A few are a bit silly in how simple they are, but then I thought, "Well, d'uh! Why didn't I think of that?!" And that's where the genius of the book becomes crystal clear. 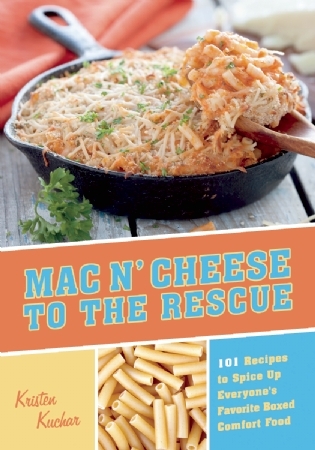 For the most part, "Mac 'N Cheese to the Rescue" is filled with recipes one can use on those days when you stare at your open freezer & cupboard thinking, "Oh, not spaghetti again!" Rather you'll know exactly what to do with the leftover rotisserie chicken you picked up last night. Is there a worse task to do after a long day at work than figuring out new ideas on how to eat leftovers before you have to thrown them out? OMG, do I hate throwing food (and money) away! There are also plenty of recipes that don't require leftovers. "Mac 'N Cheese to the Rescue" could also be a great resource for older children. Whether they are fending for themselves or tasked with making dinner once a week, these recipes are easy to follow without a ton of fancy techniques. Only yummy results! Get your copy through Powells or Indiebooks. Disclaimer: Kristen and I are on an organizational discussion list together. When she mentioned this book was coming out, I asked for a copy to review.